Methods for machine learning (support vector machines) and image processing (color deconvolution) are combined in this paper for the purpose of separating colors in images of documents. After determining the background color, samples from the image that are representative of the colors to be separated are mapped to a feature space. Given the clusters of samples of either color the support vector machine (SVM) method is used to find an optimal separating line between the clusters in feature space. Deconvolution image processing parameters are determined from the separating line. 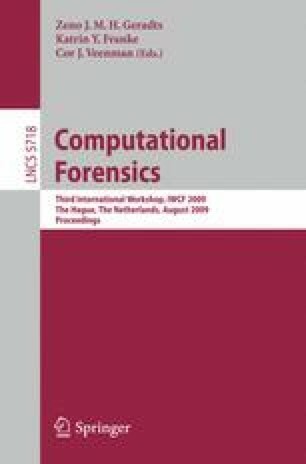 A number of examples of applications in forensic casework are presented.